Hakkasan is the hot new nightclub at MGM Grand and it’s enormous: 80,000 square feet; capacity 7000+ people. Built on five levels, including a restaurant, estimates of its cost run as high as $200 million. The club’s capacity is more than 7000 people. The TurboSound Line Array System was intended for a major concert arena and the spectacular lighting system features Robin Pointe lights from Europe. The Hakkasan nightclub Las Vegas’s design allows revelers to see the DJ booth from practically anywhere on the main level and the servers outfits change according to whichever resident DJ is on duty. Hakkasan’s Pavilion level features a two-story indoor waterfall and yet another DJ. 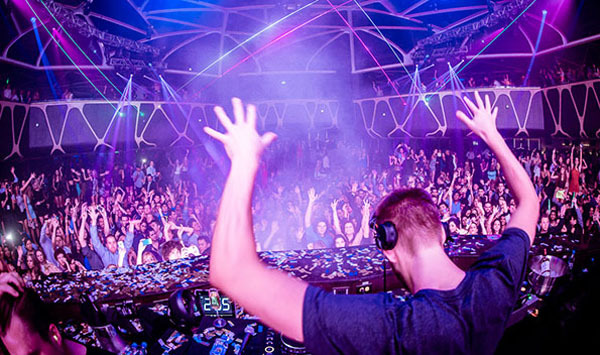 DJ Tiesto has announced his residency at Hakkasan Las Vegas Restaurant & Nightclub for 2013 and 2014. As part of his 20-month deal with MGM, Tiësto will perform more than 20 daytime shows at the Wet Republic outdoor pool. But the crux of his residency will be more than 40 gigs at Hakkasan. Check out our Events Calendar and see what’s happening at Hakkasan Nightclub Las Vegas and view the Dress Code!